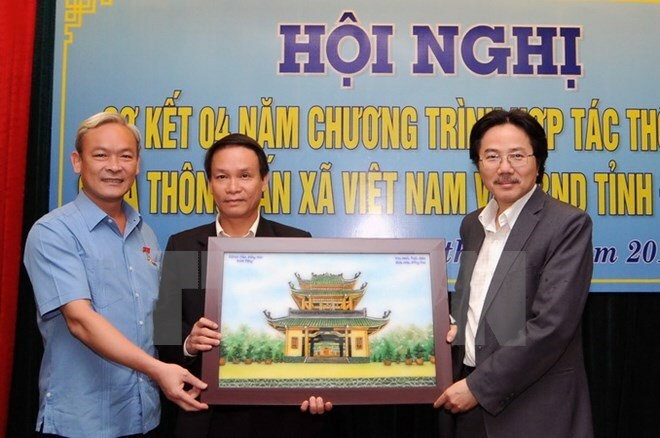 Dong Nai (VNA) – The State-run Vietnam News Agency (VNA) and authorities of the southern Dong Nai province hosted a conference on March 7 to review their four-year communications cooperation. Over the past four years, VNA’s provincial representative office and other units have published more than 3,300 articles and documentaries on printed newspapers, its electronic news portal and television channel. The representative office runs 2-3 news stories and articles everyday covering local socio-economic development; particularly those regarding infrastructure development, human resources training, environmental protection, and the shift to hi-tech industries, which are in line with the province’s target programmes on socio-economic development for 2011-2015. Outstanding examples of new rural construction, among others, were also featured. VNA General Director Nguyen Duc Loi said the locality-featured news has been published in various forms and different languages, including Vietnamese, English, Chinese, French, Spanish and ethnic minorities’ languages; which are also provided to domestic and foreign news outlets as well as audiences at home and abroad, such as investors and foreign visitors. VNA’s news service has helped country leaders, people nationwide and foreigners, gain an insight into Dong Nai – a dynamic industrial province that adds significant revenue to the State budget and has generated jobs for hundreds of workers, he said.